Brunch in the West is often challenging. Yes, there are lots of brunch spots west of Decarie but I often find that they have similar menus and aren’t really creative in terms of what they make. Having gone to hundreds of different brunch spots, I get tired of the usual bacon and eggs so when our brunch brought us out west, I had to look around and find something a little different. That’s when Café Grand comes in. 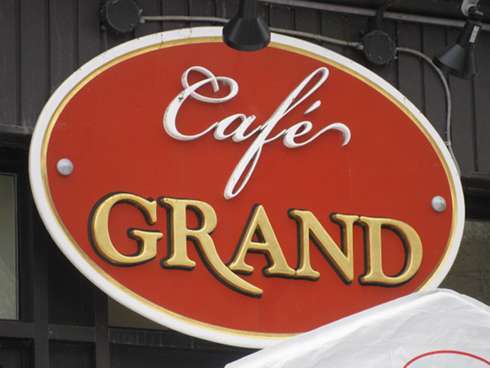 Café Grand has been in NDG for some time and, to be honest, my editor used to live 2 streets away so how I missed this place is kind of a mystery. 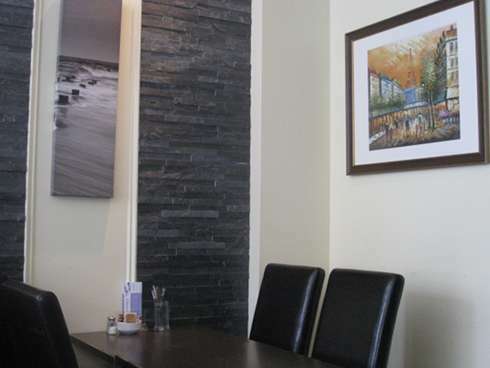 The place itself is cozy and nicely decorated. With a vestibule in the winter to break the cold you get a side dining area on the left and a main one when you first walk in. Food The menu is rather short with only 13 items. The average price of a dish is $15 and coffee is extra at $2.25 which comes with free refills. The dishes are quite unique as you will find items like: chicken and waffles, biscuits, and quinoa – which you don’t find your average brunch menu. 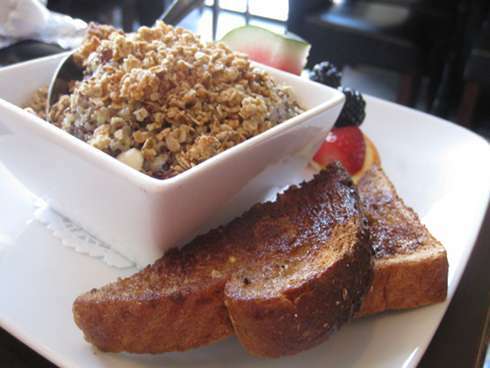 We started off with the quinoa dish ($12.95) which comes with bread on the side as well as fruit. The quinoa had berries in the dish mixed in it and it was nice and warm. This dish is unique in that it has a healthy option like quinoa, which we don’t often associate with brunch, yet, Café Grand manages to pull it off. 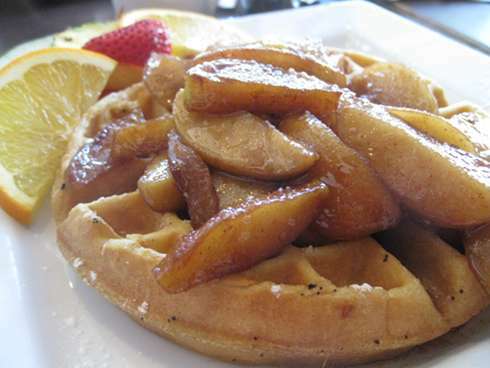 The warm apple waffle ($14.95) is a large fluffy waffle with loads of warm apple slices on top. This dish is quite large and the warm sweet apples are a hit. The waffles were good – not too mushy or hard. I would have liked to see something funky like having another ingredient worked into the waffle batter. 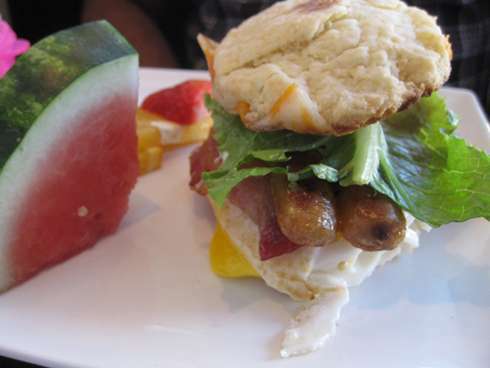 Lastly, the buttermilk biscuit sandwich ($9.95) came with a side of fruit, two breakfast sausages, lettuce, eggs and cheese. The dish was a little small although the price is under $10, which is one of lower priced items so you can get something extra that will run you $15. Biscuits are something we do not find often in Montreal as this is more of an American item, so it’s really nice to have this for brunch in Montreal. Service Café Grand is small so there is not a huge team of staff although, our order was taken quickly and our dishes came out with hardly any delay. Our waiter was nice and gave some suggestions, which were helpful. With a small menu, you are safe with half of the items being vegetarian friendly. The quinoa dish is a very unique vegetarian dish that hopefully other places will take a note and take some inspiration from this dish..
Wrap up Café Grand has some really interesting dishes which are tasty. The quinoa and biscuit dishes are very creative and worth trying out. I did find that the price of an average bill gets close to $20 when you add the coffee which is a tad high for my liking.